Former Miami Dolphins Head Coach Joe Philbin has reportedly passed on an offer to join Head Coach Ben McAdoo’s staff. Instead, Philbin is now the new assistant head coach and offensive line coach of the Indianapolis Colts. On Philbin, told he had interest from a few places, considered NYG heavily but never committed. Interviewed w/ Colts and opted for that gig. 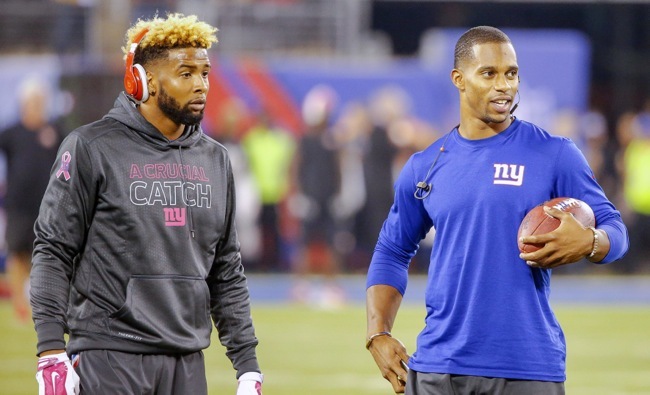 New York Giants Wide Receivers Coach Sean Ryan has left the team to become the new wide receivers coach of the Houston Texans. 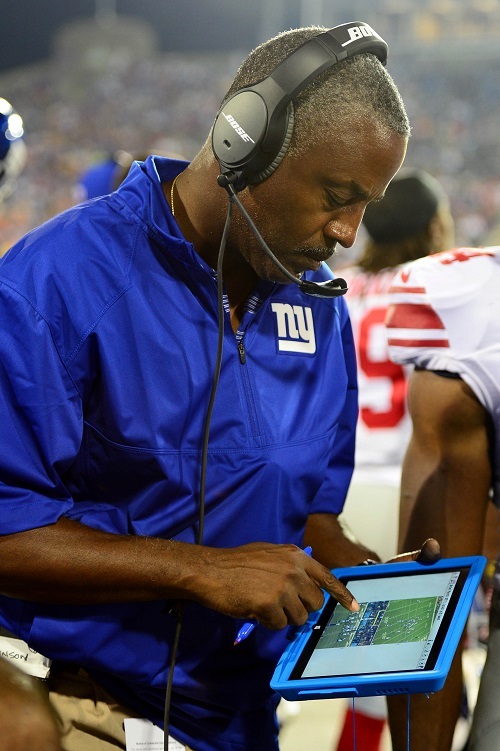 Ryan joined the Giants’ staff in 2007 and served as offensive quality control coach (2007-2009), quarterbacks coach (2012-2013), and wide receivers coach (2010-2011, 2014-2015). 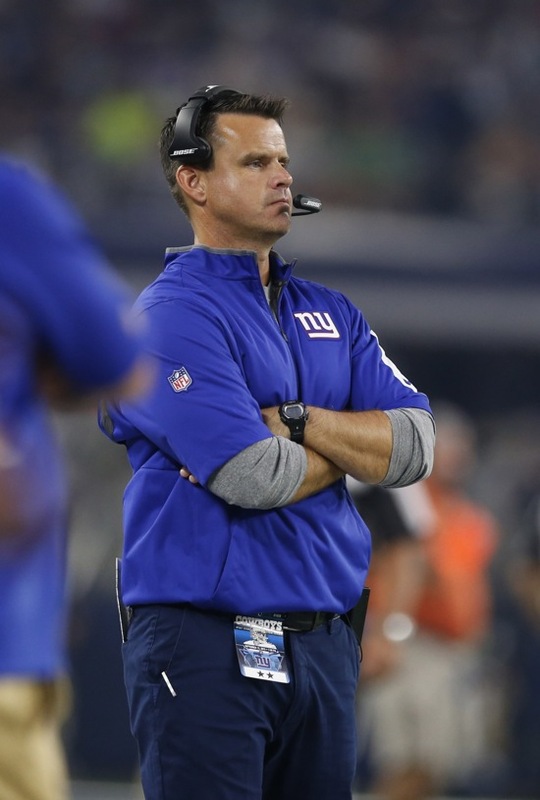 New York Giants Assistant Special Teams Coach Larry Izzo has left the team to become the new special teams coordinator of the Houston Texans. Izzo joined the Giants’ staff in 2011. The video of Friday’s Michael Kay Show interview with Head Coach Ben McAdoo is available at YESNetwork.com. 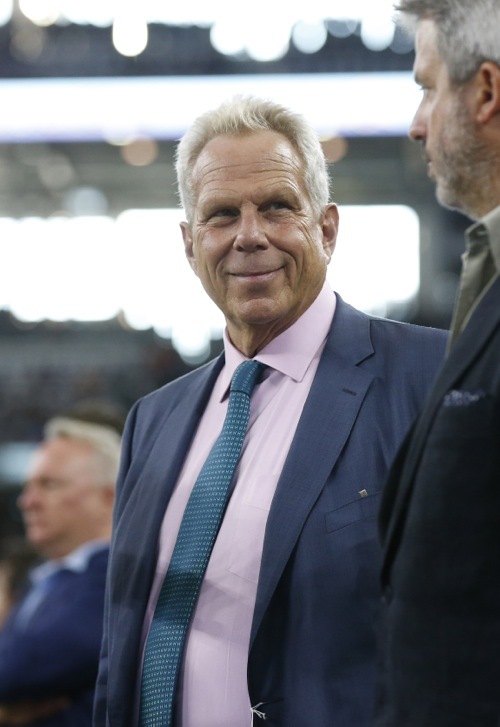 New York Giants Chairman and Executive Vice President Steve Tisch told reporters at an NFL meeting on Tuesday night that the team hopes to have selected its new head coach by the end of this week. All New York Giants coaching interviews have been jointly conducted by team President/CEO John Mara and Senior Vice President/General Manager Jerry Reese. Gase has already been hired by the Dolphins. “I have a couple candidates who I think will be potentially really good head coaches, but I want to reserve expressing my thoughts to you until John, Jerry and I have a chance to talk later in the week,” Tisch said. The New York Giants interview of Bengals Offensive Coordinator Hue Jackson never occurred. Jackson, who reportedly was set to interview with the Giants on Wednesday, was hired by the Cleveland Browns as their new head coach on Wednesday instead. Jackson had also interviewed with the San Francisco 49ers. NYG interest in Hue Jackson made it interesting but Jackson was telling friends recently it was Cle or SF all the way. Although all of the New York Giants assistant coaches have 1-year remaining on their contracts, the team has apparently given permission to some, if not all, of them to interview elsewhere. Wide Receivers Coach Sean Ryan is interviewing with the Houston Texans for the same position. Offensive Line Coach Pat Flaherty has interviewed with the Indianapolis Colts and Minnesota Vikings for the same position. Linebackers Coach Jim Herrmann has interviewed with the Indianapolis Colts for the same position. The Colts hired Herrmann on Wednesday. 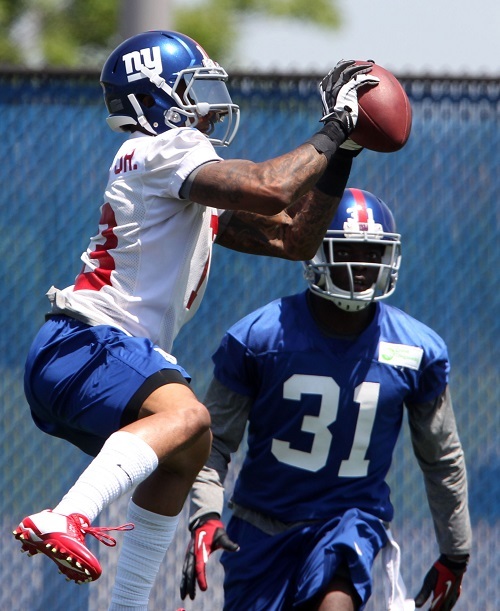 The New York Giants held their fourth summer training camp practice on Monday at Quest Diagnostics Training Center in East Rutherford, New Jersey. The full training camp schedule is available at Giants.com. Defensive end Jason Pierre-Paul (hand/arm) still has not signed his 1-year Franchise tender and has not reported to training camp. ESPN is reporting that Pierre-Paul plans to play this season but he will not sign his tender until he is sure he can pass a physical. General Manager Jerry Reese said he had a “great conversation” with Pierre-Paul on Sunday and has also spoken to his agents. He did not offer any details on what was said. Pierre-Paul has also spoken to Giants Senior Vice President of Medical Services Ronnie Barnes and Defensive Line Coach Robert Nunn. With Ereck Flowers (hip flexor) out, the starting offensive line was left tackle Justin Pugh, left guard Adam Gettis, center Weston Richburg, right guard Geoff Schwartz, and right tackle Marshall Newhouse. The Giants also worked in John Jerry at right guard, Dallas Reynolds at left guard, and Geoff Schwartz at right tackle. Bennett Jackson and Mykkele Thompson worked as the first-team safeties with Landon Collins and Jeromy Miles working with the second-team. Left tackle Justin Pugh and defensive end Damontre Moore got into a fight. Running back Shane Vereen continues to look sharp catching passes out of the backfield. Art Stapleton of The Bergen Record said his three stars of practice were linebacker Devon Kennard, safety Bennett Jackson, and quarterback Eli Manning. He also pointed out that Manning has yet to throw an interception in training camp. Q: Have you ever seen a player change positions the way Bennett Jackson has from corner to safety? A: Yeah, I think so. Sure. Guys change their position whether it be somewhere in the college ranks or in the pro game. He’s progressing and we hope he continues to because it’s early and there’s a lot to go. Q: The guys that do it successfully, do you notice a commonality with those guys? A: Well, basically they have an awareness and the big picture of how to play–what the game is all about. Because they’ve been in the secondary, they listen, they see, they listen to corrections. Whether you’re a corner or a safety and you’re playing a specific coverage and if you listen over and over again to what the important ingredients are to play the coverage well, and then the corrections. He’s a smart kid. I’m sure he adapted some of that, although he may not be able to put his finger on it like I’m saying it. There’s the commonality, I think—you’re a player, you’re a football player. Q: How bad is Ereck Flowers? A: He doesn’t seem to be bad. It’s a hip flexor issue. This morning he was sore, but by the time I caught him in the meeting room, he was doing this [stretches leg]. Hopefully, it’s just a short amount of time. Q: Is it something that happened during the practice yesterday? A: No, a couple of days ago. Q: So he played through it for a little bit? A: He tried to, yeah. Q: What have you seen out of Robert Ayers and can he be that dynamic presence? A: Robert has played well. He’s been a really good soldier, he’s been a good teammate. He’s grabbed guys and talked to them, whether it be in the meeting rooms or out here. He’s worked hard. I’ve seen nothing but good things out of him. Q: Chykie Brown looked like he walked off. Anything on him? A: I’m not sure what it is. They said something about a foot or possibly a shoe issue or something. Hopefully, that’s it. He’s been doing pretty well, he’s been flashing a lot. I’d like to see him stay with it, he’s very motivated. 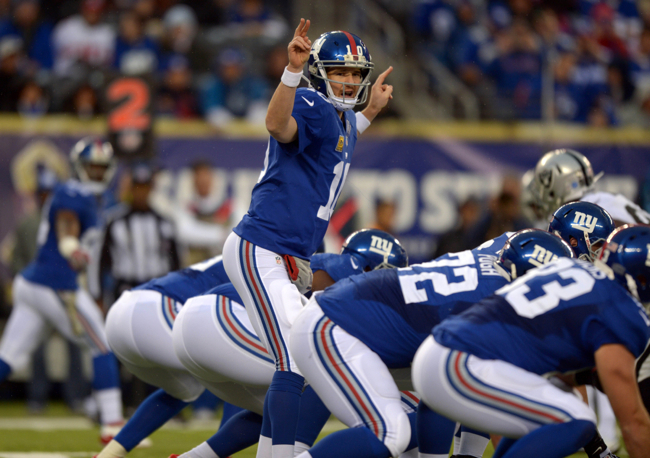 Q: Can you talk about Justin Pugh’s versatility and what he brings to the table? A: Well, he’s obviously played left tackle in college. He came here and played right tackle. In the spring we moved him to left guard knowing full well that he would have to move around. So, we thought today would be a good day to put him at left tackle. [Geoff] Schwartz came back out, so we had Schwartz out there. We had John Jerry out there so that he could do a little something with the right side as well. His versatility—he’s a smart player. Q: I know he’s only a rookie but how vital is Flowers to your offense at this point because you lost Will Beatty? A: He’s a first-round draft choice. The left tackle from last year tore a pec, he’s out there trying to learn how to play. He’s important. 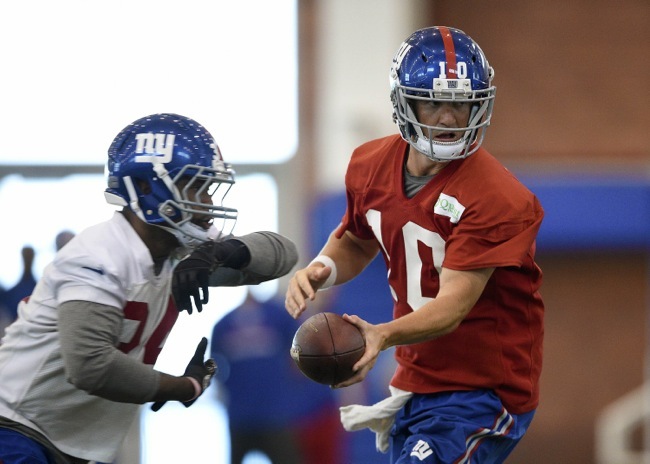 Q: You’ve been using Devon Kennard as a pass rusher, do you envision him doing that? A: I hope so, but he’s playing linebacker. You see the pressure packages, so he comes in the packages. Q: If you have to replace the sack total from JPP, is he going to add to that? A: I hope so, I hope there’s lots of guys who will add to it. I hope that we develop more people that are effective as pass rushers, no matter where they come from–secondary, linebacker, up front. Q: The first skirmish seemed to be heated but quick. A: That’s the way they usually are. Q: You have any problem with that one? A: Oh yeah, I’ve got a problem with all of them because they’re out there swinging. I’ve been hurt firsthand by a guy who broke his hand in a fight. In the old days they used to wrap it up and play with it, they don’t do that anymore. I was upset about the fight and losing their temper and all that stuff. The bottom line is you can’t afford to do it, to lose a guy. Q: Did you have to say something or did they self-regulate? A: I usually say something to everybody. Q: Gently, right? Nice, calm tone. A: However it comes out, it comes out. Sometimes not so gentle, sometimes it is. Q: This morning Jerry Reese said that he spoke to JPP yesterday, have you had that chance to speak to him yet? Q: Is that disappointing that you haven’t had the chance? A: As long as he’s talking to Jerry [Reese] or somebody in the building, it looks like there’s a chance that the communication thing will open up and when that does, I’ll end up on the phone, I’m sure. Q: How did Adam Gettis do today? A: He had a good day yesterday, I’d say so-so today. Q: Why did you decide to go that direction without Flowers, with Pugh at left tackle and Gettis there? A: Because Gettis played well yesterday and we thought this would give him a chance. If he was going to catch our eye, this would be a good way to do it. Sean Ryan addressed the media on Monday (video is available at Giants.com). Q: With Victor and Odell back on the practice field, can that help your group get better? Can everyone make everyone better? A: Oh, without a doubt, it is a great pleasure to have those guys out there because our guys have to work, they have to be really prepared. Those are two elite receivers in the league that have a lot of credibility, they are very competitive, they have good ball skills, they understand coverages and they know how to run routes, so when you go against them every day, that helps us get better so we can be better prepared for Sundays, going against guys with that experience and that athletic ability. Q: What tells you that DRC is healthier right now than he was last season? A: He has been able practice. The thing I look at is for the guys to get better, we have to practice every day. We have to be on the field and guys have been working hard on trying to do that and given the condition to be able handle the games on Sunday, he has taken a great step forward with that. A: It is good competitive fun, guys are working hard together. That makes both sides of the ball better. You have two experienced guys that understand how to play the game and that makes you go full speed and play with great effort with a great respect for each guy on the other side of the ball. Q: Tom said yesterday that DRC and Prince really haven’t had a lot of opportunities. There hasn’t been a lot of down field passing in this camp so far. Do you expect that to happen and do you need that to happen? A: Oh yeah, it will happen. It hasn’t happened against those two guys where they have a lot of opportunities now, but they are going to the fourth day of camp and they will definitely get opportunities to go in. That is what we need to be good at. We have to be good at playing the ball at the top of the route and finishing down field in the pass game, so that is a thing we will get a chance to evaluate and they need that work on it and I’m sure we’ll have plenty of opportunity to get that in. Q: Tim, I’m curious how does it work as a secondary when the cornerbacks have so much experience, especially the two starters, and the safeties have very little and yet the safeties make the calls? A: Well, it is a trust factor. Coach Merritt has done a great job with those guys. Those guys are developing and it is a family atmosphere, guys trust each other, guys work together, guys believe in each other and then guys help each other out. We’re doing this thing as a team, so everybody works together and those guys are doing a good job and …communication. You know those guys are growing up fast and they are doing a good job. If we have confidence in them outside so we are good with what they are doing. Q: I think it was Spags who said he almost asked the cornerback to sort of let [the safeties] do the talking. Are you guys still doing that? A: Yeah, and they are directing the show and we just communicate with them. They are directing the show and we let them do it to let them get the confidence of doing it. We have the experience outside for those guys but we don’t want them to ever step on their toes or try to do it for them, we want them to develop that communication on their own and we just communicate back with them, not communicating for them. Q: Is that tough with those guys though? Q: That is nice to do now on the practice field but come September 13, can you envision that changing a little bit? A: They will be ready by then. That is why we are doing it now and like you said, communication is a two way street. Obviously if something is going on, those guys have enough experience out there that they know how to help them out if the time comes when it’s needed but for the most part we are trying to let them run the show and they are doing a good job at it and like you said, if we communicate back and forth, we will all be on the same page. Q: As you get to know Prince and DRC as a combo and I know the nickel is going to come into play, can they be as good as they will need to be in this division and for this defense to do what it’s going to need to do? A: Yeah, we can be. The thing that we have to do is take it one day at a time. We need to prepare and practice each day to make sure we develop because it is a new system, it is a new scheme, you are playing with new guys, so have to make sure it all blends together and we can be as good as….they are talented guys, they are smart, they understand the game, they have toughness, but each day we come out to the practice field we want to make sure we get better because we are going to be playing against some other good teams and good players out there so we want to make sure we control what we control and that is making sure we get better each day on growing on all the little things we need to do. Q: DRC said it is a cornerback-friendly defense. My take on that was he probably has the opportunity to make some plays? A: Yeah, it is a multiple defense. We are going to have opportunities over there to make plays but what happens is, is you have to understand all facets of the defense because when it is your time to cover, we need to be able to do that. When it is time to pressure, when it is time tackle, so it is a deal where they are going to be very involved with the overall scheme with the defense. The thing we stress is being complete football players. Q: Where do you stand at this point with your slot cornerbacks? Do you feel any closer or better about that spot at this point? A: We try to have competitions at all positions. It is really early right now, so we have a long time before we play and what we have to do is evaluate the strengths and areas of improvement that each player needs to do. Even at the spots at corner, we try to create competition so we can evaluate. We move guys around so we can evaluate and try to see what works best together, what guys’ strengths and weaknesses are and now you get a chance to see it in live action. In OTAs you are just in shorts, so you can’t really tell what people can do until this time of the year, so we need to just give that process time to develop and get a true evaluation of it. Q: Jayron Hosley said that when you walked in the door you kind of broke him down and built him back up. What have you thought about his progress since you [arrived]? A: He is doing good. The thing about it is it starts with confidence and technique and the approach to the game, study habits, so we start from ground zero and go through the steps of getting to be a good player. We just go through each day to make sure we are having building blocks and he is a very coachable kid, he is buying into it, he is working, improving each day and I just try to give daily feedback on what I see. I try to be honest with him and he is taking a good step so far. Q: Is it even more important for a guy who admits that he kind of lost his way a little bit last year? A: Well, here is what happened. To go and develop and to go where you want to go, you have to first of all admit where you are. We have to always operate in an honest manner and he has…what he started to do he mentioned that to me. The first thing with that is starting to gain confidence back. But how do we do that? It is about doing all the little things, alignment, communication, study habits, all the little things that prepare you so when you get on the field you are prepared for the things you are going to see and he is doing all the little things to take that approach. I can see a change, I wasn’t here last year but I can see a step forward on his approach. Q: It’s a little early but do you have any more clarity on what you have back there? A: No. I’ll tell you, you look at these young guys and you’re still trying to make sure you figure out who’s going to be the leader, who’s going to be able to stand back and make the calls and make the adjustments that we need on game day. When you pull your eyes back and you look at it from a depth perspective, we have rookies on the field. I mean, the one guy that we have that is a veteran is Jeromy Miles, and Jeromy just came to us from Baltimore. As far as clarity and who’s going to be the starters right now— right now, it’s still wide open. Q: How long would you figure that would take to develop organically? A: We’re going to have to get into some preseason games. When you look at the practices, it’s great going against our guys every day, but once you go into the preseason games, you’re able to play against opponents, and you’re able to go against other offenses that are playing against our first defense– you’ll be able to roll some guys in and out. Then, hopefully it will clear up right away. Q: Does that become next week in Cincinnati? Does that help you accelerate the process? A: It does, it does. Always when you’re going against an opponent, that’s going to be a great eye opener for a lot of these young guys that never played in the NFL, such as a Landon Collins and Mykkele Thompson. So, once you go against an opponent, again, that’s going to clear up a lot of things. Not only just the first preseason game. You go into the second, and then hopefully by the time you roll into that second preseason game, going into the third for sure—hopefully you have this thing solidified. Q: This early in camp, how important was it to have Miles in here, not just a veteran with these young safeties but with Spags’ system. Is he kind of like a coach? A: He is, but you know what, it’s different. I heard the young man say yesterday, he said “Coach, this defense is different.” It’s because we’re not Baltimore. The thing is that some of the things they did in Baltimore, and coach Spags would be able to talk about that, it is different because Spags wasn’t the [defensive] coordinator. So, when you look at the defense they ran in Baltimore, it’s a completely different defense that we’re running here. For Jeromy, some of the techniques he understands, some of the words, some of the lingo, but as far as overall package– it is completely different. Q: You said in the spring that you were looking for which guys work well together. Are you starting to get any clarity on pairings or anything like that? A: Today, for instance, I am going to throw in Bennett Jackson. He is going to be out there with the ones, and then I’m going to try Mykkele Thompson out with the ones. The thing is that when you look at these linebackers and the corners, they need to feel comfortable about who’s going to be back making the calls. So, there’s no one that has a job that it is walking in saying “Hey, this is your starting job”. Even hough a lot of people want to put it on Landon Collins, right now, there is no clarity. I still recall the days of Kenny Phillips, when he was a first-round draft pick. Kenny Phillips had to come in here and had to fight and try to get on the field. As we all that were here understand, you had Michael Johnson and James Butler, a free agent and a seventh-round pick, that started that entire season. I’m still looking for the chemistry and hopefully that will kind of iron itself out over the next few weeks. Q: Do you look at just chemistry or do you look at abilities and being able to balance each other on the field? Or do you just look at guys who play well together? A: Of course you have to look at their abilities, but at the same time, I can have a guy who’s out there [that is] big, strong, and fast, but if he’s making mental errors, that’s going to kill you. Versus the guy who may be a little less athletic and who can go out there and make the calls and put himself in the right position. My greatest example is the one that I just gave. You’re talking Kenny Phillips, by far, was a better athlete than James Butler and Michael Johnson. But, when it came to chemistry, who was going to be out there on the field meshing this defense and the guys feel confidence in, it really goes back to two guys working together and therefore being on the same stream, being on the same accord. That’s my greatest example that I draw on as a coach from my own experience. Q: Do you ask the linebackers and corners about that, who they’re comfortable with? A: No, I don’t. The corners just go over and just listen to the call. As far as the linebackers, as a former linebacker, I don’t try to bother those guys because they have enough on their plate trying to get the defense and trying to get the front. They just need to make sure that we control the rotation and control what coverage you’re going to be in. So, I don’t ask. Q: What has Bennett Jackson shown you? Obviously he was out in the spring a lot. What do you like? A: Bennett, this kid, when he sees the ball—it’s simple: see ball, get ball. When that kid sees the ball, he goes and gets the ball. This kid’s ability to put his toe in the ground and go and burst out of his break, you guys see it out here, he’s able to make plays. He’s making production and production, as Spags has said over and over, production is at the ball. This kid is able to get his hands on a couple of balls and passes already here. By far, more than any other safety I’ve had in camp so far. When you see this kid doing those things, I’ve told them all, I’ve said “Look, the relentless meter and what we preach as far as running to the ball, guys—you have to handle that. I can sit up here and I can try to come out here in a skirt and be your cheerleader and pump you up “let’s run to the ball,” but eventually that has to come from inside of you. Bennett Jackson is one of those guys who’s a self-starter and he’s able to go out there and perform and do the things that we’re asking him to do. On top of that, he’s able to relentlessly run to the ball, which is a plus. Q: You moved him out of necessity. Do you think he’s better-suited at this position than corner? A: I do, I do. I think Bennett came in as a corner and then, near the end of camp, we tried to move him in as a nickel last season. He did fairly well in there, as a nickel. The kid can play corner, he played corner at Notre Dame as well. The fact that he’s a big kid and he’s learning the safety position, as we all know, with these safeties—you have to be ready for three safeties to be on the field. This kid who can go down and cover a slot receiver is going to be huge for us, if he’s one of the guys that we decide is going to be in there with the first group. So, it was out of necessity at first moving Bennett. He’s able to pick up the defense and being able to regurgitate it back to us, it’s been a plus for us. Q: How much of a game of catch-up has it been for Nat Berhe? Over the first few practices, has he made any strides? A: He’s made some strides. Nat, he missed the OTAs, he missed minicamp. So for him to come back in training camp, it’s just like him starting at the beginning—which it is because he missed so much time in the offseason. So, it is a learning curve for him. You’ll see him out today and running around and he’s picking it up though. But, he’s definitely behind the eight ball right now a little bit. Q: Is he gaining any ground? A: Well, you know what? Two practices, three practices—he’s moving slowly. Snail’s pace. Q: You said you’re going to get Mykkele Thompson with the first group, what are you seeing from him so far? A: Smart kid. Mykkele is one of those kids that is able to take it from the classroom and it appears, so far, take it to the field. Even with the checks that we have on the backend. With him being able to think and being able to maybe be a quarterback on the field—that’s what I see from him. He’s a smart kid. Hopefully, he’ll be able to control the coverages today and along with the heat, we’ll see if he can think. Q: It’s very early, but do you see Jackson being a productive member of this secondary and possibly starting? A: I see him being a productive member of the secondary. As far as starter, again, it’s wide open. There are not starters right now. Giving him an opportunity yesterday, he went with the first group, today he’s going to go with the first group. I told him, “Once you get in there and you’re able to step into a first team role, don’t give it back. Don’t sit up here and have me turn around and throw another guy in there. If you’re in there as a starter with the first group, hold your position.” It’s very early, again, we have no starters, but we have that first team, second team. I told them, “At the end of the day, however Mr. Mara, however Mr. Reese, however many guys that Coach Coughlin decide to keep, if it’s four—you’re all going to be starters. You have to think of yourself that way. You cannot look at yourself as a backup.” So the one thing that I like right now is rotating these guys around because no one has a position locked down. Q: Will you work Thompson with Jackson today with the ones? A: Yes sir, that’ll be the group that you’ll see out there today with the ones. Hopefully these kids can go out there and perform and do the duties that we’re asking them to do. Q: One of the things that we’ve noticed in practice is that you guys run your fits in both first and second groups at the same time. What’s the benefit of that? A: The benefit of that is when you’re out here and going through jog-through, going through walkthrough and we’re trying to get the guys to have multiple reps in practice. A lot of times its hard having one team out there and sending them through five or six plays then the second unit gets out there for five or six plays. What we do is we stack them, you go out there and stack your position. Therefore, you have the first and second team out there running the same reps that the guys would get if they’re waiting. It’s just a time saver, which has been good. Q: Physical or mental reps? Q: Some guys have said that maybe Landon is a little more advanced because of where he went to college. Do you feel that way? A: Well, if he had gone to NC State (Merritt’s alma mater), then he would definitely be advanced, but I won’t get into that. As far as Alabama and all the schools, that to me, he’s coming from a good program. Landon has the ability to probably be able to receive more information and to be able to go out and perform it because of the system that he came from Nick Saban, who was a long time NFL coach, so the fact that he had that system down in Alabama, I would probably say that he may be a little more pro-ready than some of the other guys who maybe have come from a smaller school, such as I won’t say that blue school in the state of North Carolina. S Antrel Rolle on WFAN Radio: The audio of Tuesday’s WFAN interview with S Antrel Rolle is available at CBS New York. 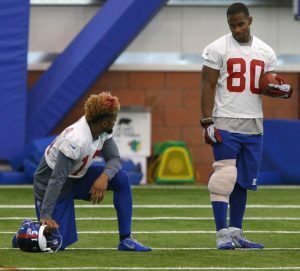 August 5, 2014 New York Giants Injury Report: Not practicing on Tuesday were WR Odell Beckham (hamstring), WR Trindon Holliday (hamstring), Daniel Fells (knee), TE Xavier Grimble (hamstring), DT Mike Patterson (shoulder), LB Jon Beason (PUP – foot), and CB Bennett Jackson (ankle). RB Peyton Hillis left practice early with an ankle injury. LT Will Beatty (headache), Eric Herman (hip), DE Robert Ayers (ankle), Spencer Paysinger (concussion), and Trumaine McBride (hip) all practiced. Head Coach Tom Coughlin clarified that some players coming off of offseason surgery were never going to play in last weekend’s Hall of Fame preseason game. 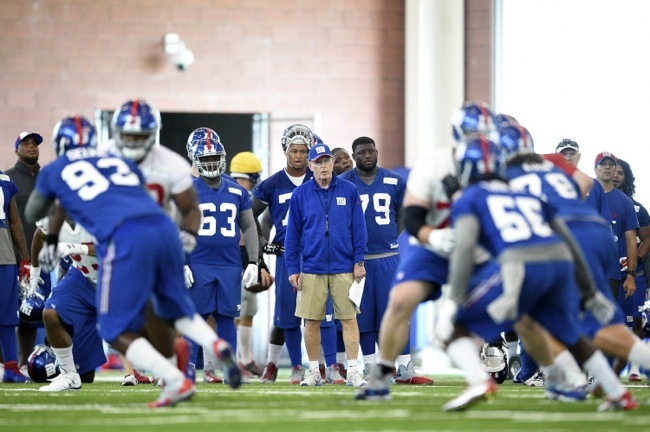 New York Giants Mini-Camp Ends: The third and final day of the New York Giants mandatory, 3-day mini-camp was held on Thursday. Practice was called after only a few minutes when rain started to fall. 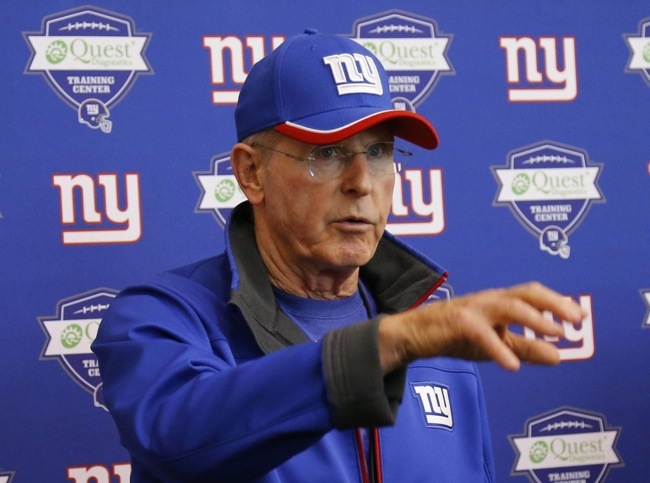 Head Coach Tom Coughlin chose not to continue practice within the team’s indoor facility. The rookies will spend one more day at Quest Diagnostics Center. Players are off until scheduled to report to Quest Diagnostics Center on July 21 for the start of summer training camp. New York Giants Sign OT DeMarcus Love and DT Everett Dawkins: The Giants have signed street free agents OT DeMarcus Love and DT Everett Dawkins. To make room for these two, the Giants waived OT Steven Baker and DT Eathyn Manumaleuna. 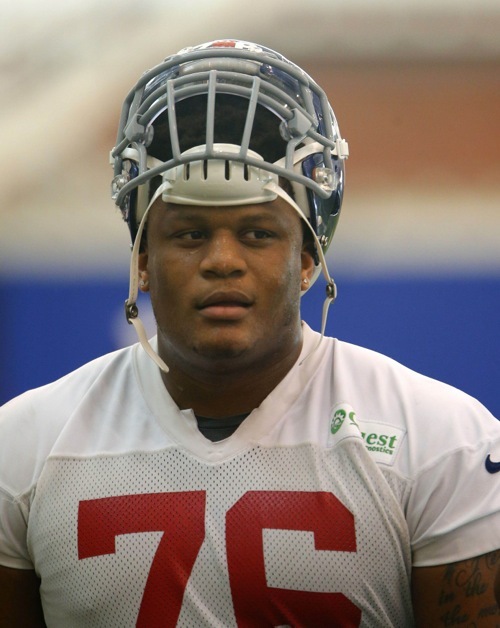 The Giants signed DeMarcus Love as a street free agent in June 2014. Love was originally drafted in the 6th round of the 2011 NFL Draft by the Minnesota Vikings. The Vikings waived him in October 2013 and he was then picked up by the Jacksonville Jaguars, who waived him in June 2014. Love has a nice combination of size and athleticism. He needs to play with more nastiness and fire. He also needs to improve his overall technique in order to make it at the NFL level. The Giants signed Everett Dawkins as a street free agent in June 2014. Dawkins was originally drafted in the 7th round of the 2013 NFL Draft by the Minnesota Vikings. The Dallas Cowboys signed Dawkins off of the Vikings Practice Squad in November 2013, but waived him three weeks later. The Tampa Bay Buccaneers then signed him to their Practice Squad. The Buccaneers waived Dawkins in June 2014. Dawkins is a 3-technique tackle who lacks ideal size, but he is quick and athletic and can be disruptive. He needs to add size and strength. Dawkins is not overly stout against the run. He needs to play with better leaverage. New York Giants Officially Hire Danny Langsdorf as Quarterbacks Coach; Reassign Sean Ryan and Kevin M. Gilbride: The Giants officially announced on Monday that they have hired Danny Langsdorf as their new quarterbacks coach. Since 2005, Langsdorf has been the offensive coordinator and quarterbacks coach at Oregon State University. 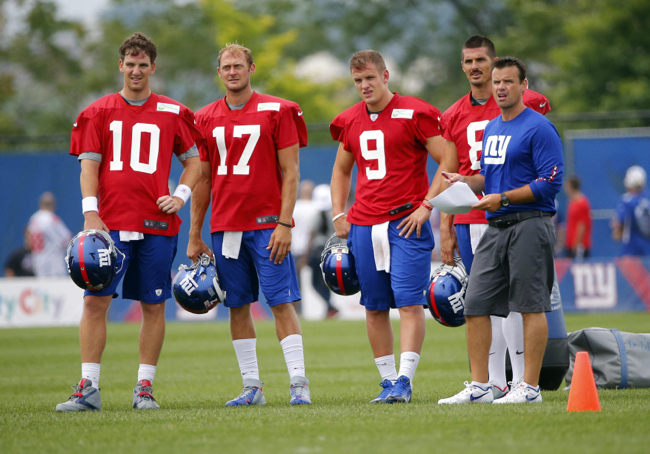 Sean Ryan, who served as the Giants quarterback coach in 2012-13, will now coach the wide receivers again. Ryan was the Giants wide receivers coach in 2010-11. 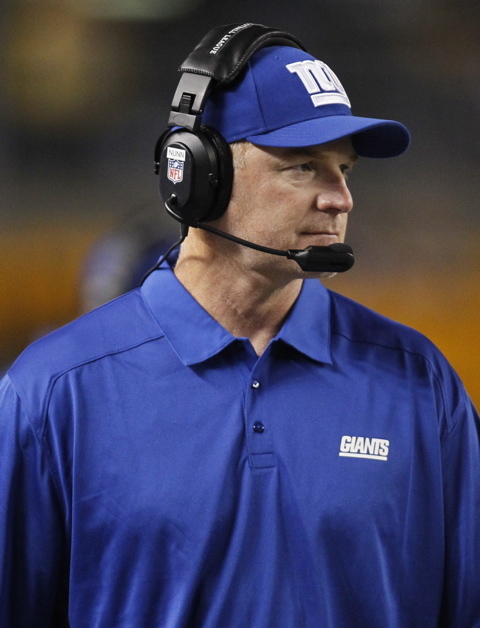 Kevin M. Gilbride, who served as the Giants wide receivers coach in 2012-13, will now coach the tight ends. Gilbride is the son of recently-retired Giants offensive coordinator Kevin Gilbride. So to summarize the offseason coaching moves: offensive coordinator Kevin Gilbride retired and tight ends coach Mike Pope and running backs coach Jerald Ingram were fired. Ben McAdoo was hired as the team’s new offensive coordinator, Langsdorf as the new quarterbacks coach, and Craig Johnson as the new running backs coach. Ryan and Gilbride were reassigned. The only offensive coaches who will return in the same position are offensive line coach Pat Flaherty, assistant offensive line coach Lunda Wells, and offensive assistant Ryan Roeder. “When I went through the process of studying his years at Oregon State, I was very impressed with the number of quarterbacks that were highly, highly productive in the Oregon State program, including redshirt freshmen,” Coughlin said. “And also in the years, with Jacquizz Rodgers, for example, they ran the ball. So he has adapted to a lot of different things. Then when I had the opportunity to interview him, I would take specific areas in which I think the college game is doing a darn good job, and his ability to relate and teach in these areas, I thought, was outstanding. Neither Langdorf nor Coughlin think Langdorf’s collegiate coaching background will be an issue. Langsdorf and McAdoo worked together for one season on the coaching staff of the New Orleans Saints. For a complete overview of the coaching staff and their respective resumes, see the Coaching Staff section of the website. New York Giants Hire Danny Langsdorf as New Quarterbacks Coach: Though not officially announced, according to multiple press reports, the Giants have hired 41-yeal old Danny Langsdorf as their new quarterbacks coach. Langsdorf has served as the University of Oregon’s offensive coordinator and quarterbacks coach since 2005. In 2002-2004, Langsdorf was with the New Orleans Saints, and his career overlapped with new Giants offensive coordinator Ben McAdoo in New Orleans in 2004. Sean Ryan was the Giants’ quarterbacks coach in 2012-2013. According to press reports, Ryan has not been told he will be let go but will be reassigned to another position. The Giants’ tight end coaching position is still vacant. For Langsdorf’s complete resume, see the Coaching Staff section of the website.